This cream of tomato soup with cheddar is a delicious hot soup to enjoy for lunch. 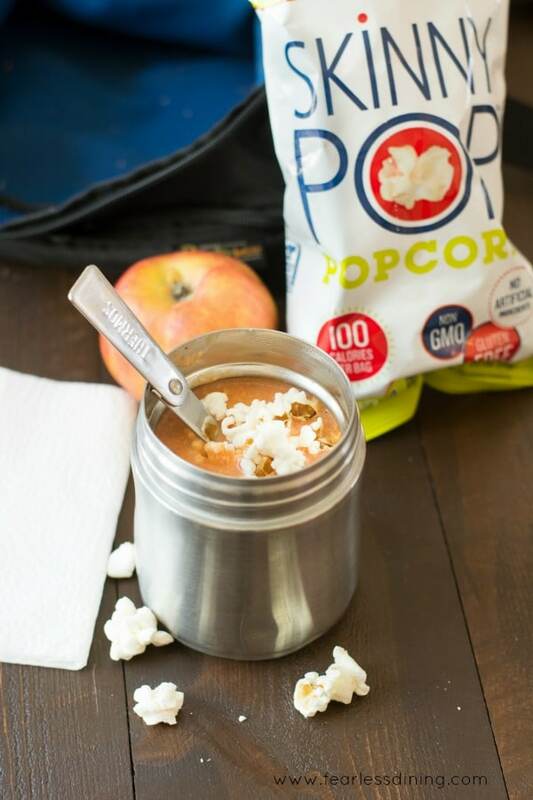 Toss in your favorite popcorn to add a special treat to your soup. Creamy and hot, this is the perfect soup to pack in a thermos for lunch! School has started and the weather is finally cooling off here in Northern California. 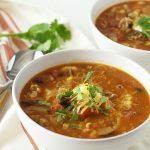 Soup is comfort food and my kids love to bring hot soup in their lunchboxes. This healthy cream of tomato soup is part of a nutritious lunch! Last week I bought a case of heirloom tomatoes at our local farmer’s market and I had a few left to use in this soup. You will notice heirloom tomatoes right away because they don’t look “perfect” like store-bought tomatoes. They are bumpy and curvy and come in fun colors. I love using fresh tomatoes when they are in season. Summer is the best time for fresh heirloom tomatoes. Each year we had a garden and grew our own tomatoes. Two years ago California had a horrible drought and we let our garden go. Hopefully, we can restart it up again in the spring! For this recipe, I used a combination of yellow and red tomatoes. Another fresh item in this soup is basil. Basil can be grown year round. 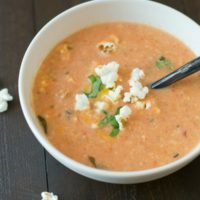 I like to pick up a fresh plant every few months from our grocery store so I always have fresh basil on-hand for my recipes like this cream of tomato soup. 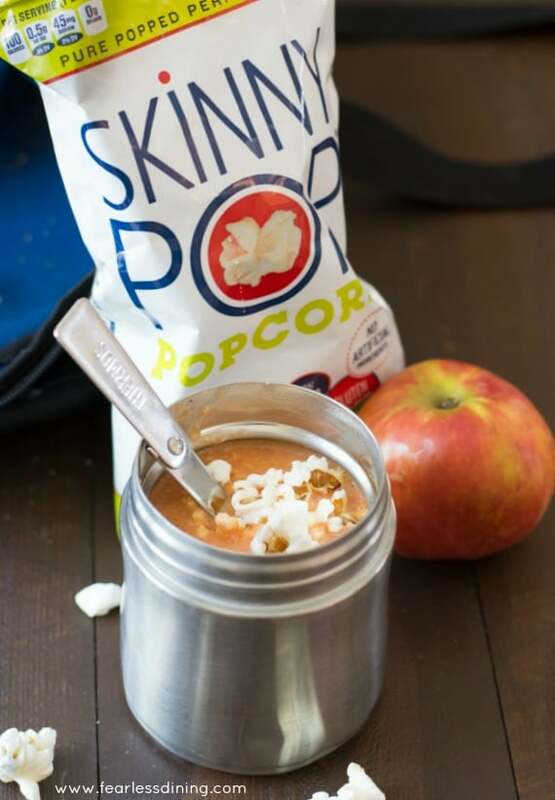 Have you tried SkinnyPop popcorn? This has become a staple on my kids’ lunches not only to eat but also to play with. I hate to admit it, but one of my son’s favorite games at lunch is when he and his friends toss popcorn into the air and his friends catch it in their mouths. This may be a teen boy thing, but it is definitely a popular game…the boys are pretty good! Almost no popcorn hits the ground! I feel good knowing they are eating a popcorn that is natural. SkinnyPop has just three ingredients; corn, salt, and oil. Kids can pronounce every ingredient on the label!! Another favorite thing to do with SkinnyPop is to add it to soup!! It is the perfect gluten-free crouton substitute!! This simple tomato soup recipe is creamy, delicious, and full of fresh tomato flavors. Enjoy it anytime! You will find this creamy tomato soup recipe is really easy to make. 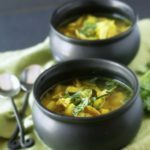 A few people asked me how to use a Vitamix to make this soup. It is so easy to use a Vitamix to prep this recipe. I removed the stem from the tomatoes, then added them to my Vitamix blender. I pureed the tomatoes on high to liquefy them. Next, I added that tomato puree to a saucepan with the rest of the ingredients. I let the soup bubble on low until it became nice and creamy. 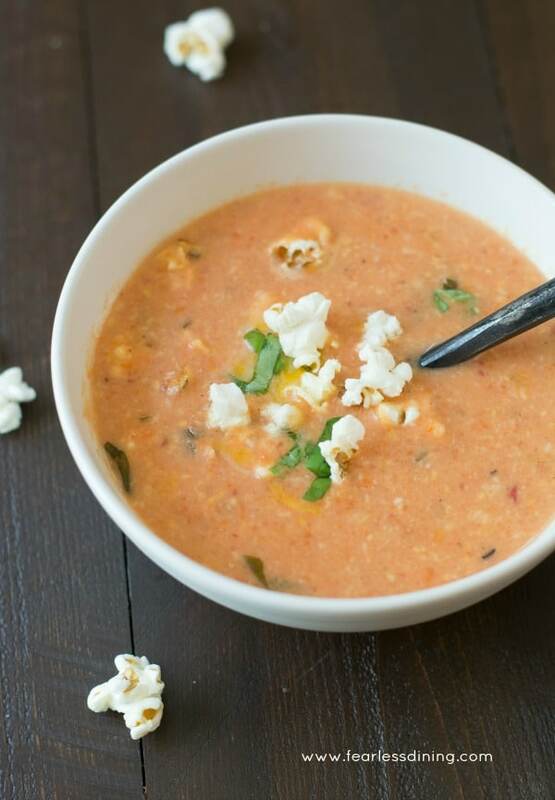 I garnished this soup with more fresh basil and the popcorn! 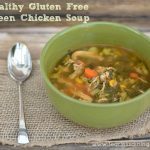 If you have nice gluten-free crusty bread or rolls, they are quite good dipped in this soup. Try roasting your fresh tomatoes with olive oil and garlic in the oven. You can put them in a baking dish and drizzle them with olive oil. Roast on 300 degrees for 20-30 minutes until they are really soft. Instead of fresh basil, try fresh thyme for a new flavor. If you want, feel free to change up the cheese and use a smokey gouda. Add some sautéd spinach cooked with olive oil to add some healthy greens. Make sure you chop it up a little before adding to the soup. If you would like a creamy garnish, top with a little sour cream or yogurt. Creamy cheddar tomato soup recipe. Chop tomatoes and add to a blender or Vitamix. Puree until liquefied. Add tomato puree to a pot. Add water, chicken broth, garlic, basil, salt and pepper and bring to a boil. Allow to boil for 3-4 minutes, then reduce to a simmer for 10 minutes. Add cheese and cream and whisk to blend. Simmer another 5 minutes and serve hot. Garnish with cheese, fresh basil, and popcorn. I used to take soup to school all the time in my thermos. My kids think that it is weird to bring hot soup to school but they don’t have microwaves to use. I need to see if I can find a thermos that they can take to school and keep the soup warm. I loved tomato soup as a kid and put goldfish in mine! I can see why this would be popular with children. I like the idea of the creamy tomato soup and the crunch of the popcorn. It is a good alternative to croutons that’s for sure. Popcorn instead of croutons to sprinkle on top of a soup?GENIUS! The soup looks very hearty and I love you used very simple ingredients 🙂 I’m definitely gonna give it a try! love that you added popcorn as a topping! Genius! Popcorn in soup? Why did I never think of that! Definitely have to give this a try. I LOVE creamy soups! Your version with cheddar looks fantastic. Yum!